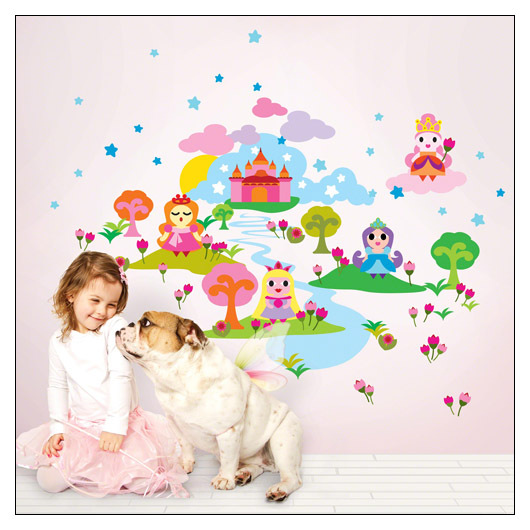 French Bull Princess Reusable Decals by Wallcandy (WCFBP) at Pure Design Kids / Toys / Wallcandy ::: Kids' Toys, Furniture and More at Pure Design Kids! Create a playful getaway for your little darling with this princess story kit! Includes: 4 princesses (each 7" tall), 7 clouds (smallest is 8"), 3 hilly meadows, 11 patches of grass, 35 flowers, 23 stars, 5 trees, 7 flowing rivers, 1 castle, and 1 sun.